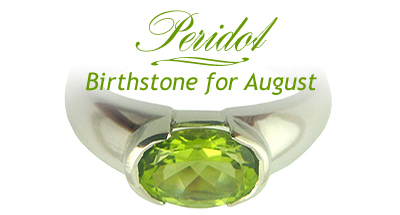 If you or your loved one has a birthday in August, peridot is the birthstone to choose. Peridots have a pleasant green colour and are symbolic of vitality. They signify strength, both individual and within a relationship, as well as the promise of new growth in years ahead. Peridot ranges in color from light yellow-green to the intense bright green of new spring grass to olive. Because of the way peridot splits and bends the rays of light passing through it, it has a velvety appearance, a rich glow, and a slightly greasy luster. Good news for the jewellery lovers is that recently several new deposits have been discovered so now these precious stones are more numerous and much more affordable.